A 20-story Miami Beach condominium building was aging and ready for a roof replacement. Perkins Roofing was able to offer the condo HOA board a silicone coating system, equaling half the cost of a traditional re-roof. 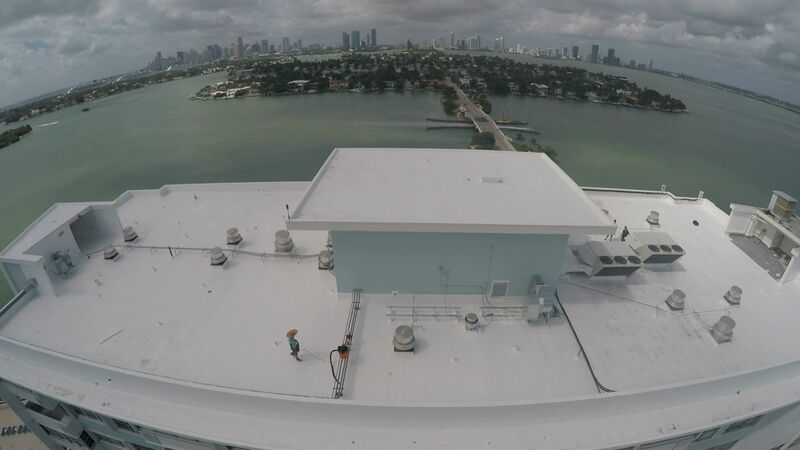 GAF’s United Coatings™ Unisil Roof Coating system, an elastomeric silicone coating providing weatherproofing, UV protection, biological growth resistance and more, was used. Danny Pena and Rich Murton of GAF were helpful in qualifying the Miami Beach condo project a 15-year NDL manufacturer’s (No Dollar Limit) warranty. In addition, small, open catwalks with 200-foot drop-offs were successfully coated by the Perkins Roofing crew.